Kaeser boosters with drive powers ranging from 22 to 45 kW are available in a new design: as compact and space-saving complete units optimised for low vibration and noise emissions. Future versions will also feature optionally available frequency control. Many additional enhancements, such as optimised cooling, further reduce overall system and energy costs. Previously this size of booster was only available in conventional versions - without Sigma Frequency Control (SFC). The new drive function ensures superior harmonisation on the input side with the upstream compressor output. This in turn allows for reduction of the relatively high switching frequency characteristic of some booster applications. It&apos;s precisely because applications do not always work with the same pressure that boosters must produce significantly greater pressure than is actually used in the application. 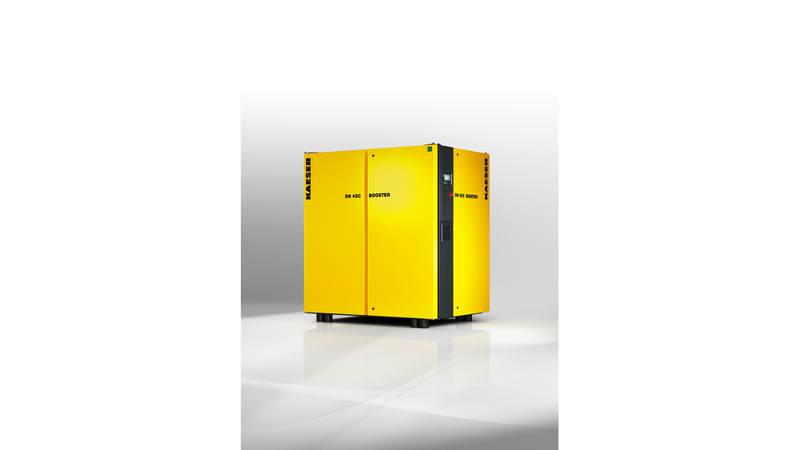 The powerful SFC functionality helps adjust the free air delivery as consistently as possible to the needs. This reduces switching differentials on both sides, as well as potentially resulting overpressure, leaks and machine load - all of which contribute to energy savings. The dynamic appearance of the new, complete-unit design is not just cosmetic: it saves space (just 2.3 m² instead of 5 m²) and makes maintenance even more straightforward thanks to intelligent component layout. For added convenience, the boosters are ready for immediate electrical connection upon delivery, thereby greatly minimising installation time and costs. The integrated Sigma Control 2 controller is equipped with special booster software to ensure optimal system operation whilst also enabling convenient connection to master controller systems via Ethernet. Since all individual components can be perfectly coordinated with one another, the entire station can be optimised to provide maximum efficiency and performance. Integration is also possible within an Industry 4.0 environment.